I am humbled by one thing though, the willingness of complete strangers to host us for a night or two. We all watch the news and get more and more frightened to step outside of our front door, because of 'strangers' but a handful of complete strangers have opened their homes to us. So far we have offers of hosting in germany, Italy and croatia, plus a city tour of Zuirich. I love that there are still people in the world who are open to making new friends and to meeting new people. Those are my tribe and I am so looking forward to meeting some of them. I am down to the last few items on my to-do list. I am still working out some way of mozzie proofing the van so that we can have windows open while we sleep. I am a mozzie banquet and there is a heatwave across mainland europe (yay! sunshine) so I have been wrestling with velcro and netting, but I think I am winning. Then all I have to fix up is a shade/wind panel for the awning and make those chair covers, pack the van and we are off! Its probably a measure of the people that we are, that we are devoting as much space to books and craft materials as clothing. Its a little bit like that with this trip. I have thought so much about it, worked really hard to get Rosita mechanically sound (the mechanics are as sick of me as I am of them) wrestled with insurance, international drivers licences..etc etc...that I am ready to go now! But in truth Rosita is not fully ready yet, she needs a little curtain, blue gingham of course, since we are still doing wizard of oz theme. And I have to figure out some mosquito blinds so that we can sleep with the windows open. Its huge news for the local mosquito populations when I hit town, its like all of their christmas feasts come at once. We did another sleepover in the van last weekend at an SCA event, she is tiny but surprisingly comfortable to sleep in, mind you I reckon we will be exceedingly happy to see a fullsize bed when the trip ends. But I am looking forward to reducing down our possessions and our home for six weeks. Since we have so much space and 'stuff' here, it will be illuminating to see what we can do without. Quite a lot I suspect. Art supplies and books, that will keep us entertained. I am also really looking forward to meeting two fellow craftsters ( www.craftster.org ) on the way, one in Zurich and one in Croatia, plus if we manage to get to romania..a third..Don't you love the way the internet shrinks the world? Rosita is feeling pretty smug and I am so relieved, she passed her test with flying colours, mind you with all new brakes on the back she would want to! Still since we plan on driving over the alps, I reckon that brakes are a good idea. One step closer to the trip. Couple of messages that arrived before I had set this site up properly! Yaaayyyy! This is almost as exciting as if I were on the trip myself! That's a heck of an itinerary, but I guess you can edit it on the fly as you go. (You may be the only people to ever [i]drive[/i] to Venice!) Let the bubbly flow! Edel : thanks so much guys, Roddy I'll will txt if we get stuck, I am pretty sure you know europe better than anyone else I know. Wulf: lol, not sure we will actually be allowed 'drive' into venice, but nearby and a ferry to the city sounds good to me. Since we are in search of our own private Oz, we thought that a Dorothy theme, (crossed with 1950s retro, for a nice homely feel) would be good. When I bought the van it was filthy, smelly and chock full of bad vibes, the first thing that happened was a very thorough clean, loads of essential oils and plenty of scrubbing. I always knew I was destined to be a scrubber. The 'kitchen' was painted retro green, with a little blackboard paint on one of the doors. All of the cushions, AKA, the bed, were recovered with a reversible blue fabric. 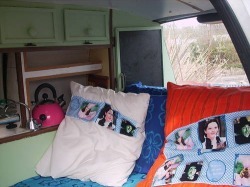 And then cushions for extra comfort, Dorothy of course. Well our trip will all happen as soon as Rosita starts co-operating. She had a DOE test, (same as an NCT, except for a van,) last week, but she failed. To backtrack on her story a little. Rosita, while masquerading as as the smallest camper van in the world, is not actually a camper van. No, according to the tax office she is a commerical vehicle. This is because they have decided that although she functions as a camper, because she is not 160cm inside at the lowest point, she is not a camper. Therefore she is taxed and insured as a commercial vehicle. Finding that out opened up a whole world of hassle, but now she is finally taxed, insured and as we speak, had her back brake well caressed by the mechanic, hopefully she will have been pleased enough with his attentions and will pass the test tomorrow. Edel and Mollie, heading off into the wild blue yonder, hopefully we will find enough internet cafes to update this fairly regularly.